Since starting my blog in 2009, I have summarized 97 books. I do this to help you with purchase decisions, and to help people review the key concepts after they have read the book. Today I am posting links to my favorite summaries from 2013. My focus is education, but I find that there are many books from the world of business that offer great advice for educators, parents, and students. All 97 summaries are still available so dig in and be sure to purchase those that appeal. Thanks again for your wonderful support and Happy New Year. Little Bets: How Breakthrough Ideas Emerge From Small Discoveries by Peter Sims explains the qualities that set innovative people apart from the pack. He summarizes a great deal of research that makes his points convincing. While this is an ideal book for high school and college students, it’s never too late for adults to take advantage of these valuable lessons. David and Goliath: Underdogs, Misfits, and the Art of Battling Giants is Malcolm Gladwell’s fourth best selling book to be summarized here. I’ve been a big fan ever since I summarized The Tipping Point. Brain Rules: 12 Principles for Surviving and Thriving at Work, Home, and School by John Medina tells how what we know about brain science can be used to positively influence our daily lives. 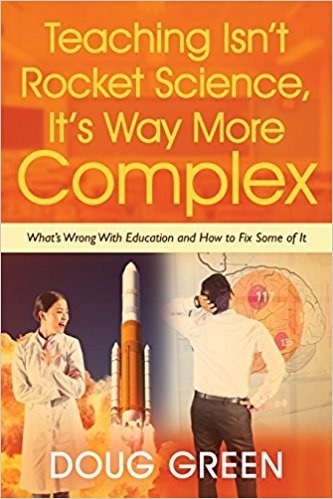 This book is vital for educators, policy makers, and anyone who wants to get more out of their gray matter. Why Students Don’t Like School? by Daniel T. Willingham answers questions about how the mind works and what it means for the classroom. The focus here is how do students’ minds work, and how you can use this knowledge to be a better teacher. Decisive: How to Make Better Choices in Life and Work by Chip & Dan Heath shares research and cool stories that show how our decisions are disrupted by an array of biases and irrationalities. They go on to introduce a four-step process designed to counteract these problems. Their fresh strategies and practical tools will enable you to make better choices at work and beyond. If you want to increase your chances of making the right decision at the right moment, this book is for you. Bull Spotting: Finding Facts in the Age of Misinformation by Loren Collins will help you spot and avoid lies in a world with more accessible truth and lies than ever. Learn how to use the tools of critical thinking to identify the common features and trends of misinformation campaigns. Loren will help you tell the difference between real conspiracies and conspiracy theories, real science from pseudoscience, and history from fantasy. This is a book everyone needs to consider. Hacking Your Education: Ditch the Lectures, Save Tens of Thousands, and Learn More Than Your Peers Ever Will by Dale J. Stephens is a handbook for people of any age who wants to take control of their own learning. Dale suggests actions you can take now and explores how school has failed almost everyone in some way. You will still need hard work and determination to thrive in the real world as this book offers an alternate approach to learning rather than an easy solution. Dale offers lots of valuable advice and many inspirational stories of success by unschoolers. To Sell Is Human: The Surprising Truth About Moving Others by Daniel Pink is a fresh look at the art and science of selling, which is something we all do. If you want to better understand others’ perspectives, make your message clearer and more persuasive, and much more, click below to purchase this book. It is purposeful and practical, and may change how you see the world as it transforms what you do at work, at school, and at home. The Element: How Finding Your Passion Changes Everything by Ken Robinson deals with the point where natural talent meets personal passion. Ken explores the conditions that lead us to live lives filled with passion, confidence, and personal achievement. The stories about people from a wide variety of fields entertain and inspire. The book is a classic. The Little Book of Talent: 52 Tips for Improving Your Skills by Daniel Coyle is a bit over 100 pages and offers specific tips for developing talent. Daniel relies on abundant research to help you copy the techniques used by the top performers in many fields. In addition to growing your own talents, this book will help parents, educators, and coaches increase the success rate of their students. Every home should have a copy. This entry was posted on Monday, December 30th, 2013 at 7:42 am	and is filed under Book Summaries, Business Books, Education Books, Leadership Books. You can follow any responses to this entry through the RSS 2.0 feed. You can leave a response, or trackback from your own site.